Well, I would say this story began early in 2008 when my oldest son John Jr. who is a Staff Sergeant (U.S. Marines) found out he would be returning home. Although only for a month, he would be able to hunt with his father John Sr. and brother - James, for the first time in many years. With a phone call John Sr. began to find a place for them to go with HSP, whom he has been a member for 3 years now and James, 2 years. After finding a place and setting up dates for the hunt we waited for deer season. As all hunters know the wait for opening day is long but this one was especially tough for my son John Jr. had not been home in almost three years. As the day came closer John Sr. double checked everything and hoped he had picked a good farm for them to hunt wanting it to be a good trip for his sons. Opening day was only two days away when the men loaded up there truck and trailer and headed off on their drive of 13 hours to the farm HSP had leased. High hopes going with them from friends and family. We arrived near our farm on Friday and rode out and looked over the farm, even spotting a nice long tined 8 point from the road. With the aid of the maps from HSP we looked over the area and decided on sites we would set up our stands. Seeing the 8 point put our hopes even higher with each hoping it would be him. That opening morning started early with the drive from our motel to getting set up on our stand sites, we were in the woods well before daylight. As morning came in, it was a cold and windy day with a hint of sleet and snow in the air. But we sat in our stands and saw a few does, yearlings, with John Jr. and James spotting a small buck but not what we were looking for. The day ended with us cold tired and ready for some hot food, but no deer yet. The second opened with nearly the same weather, cold with a hint of snow but the wind died down a bit. In our stands before daylight John Sr. discovered that there was a logging road on the property next to ours with three trucks going in and out before shooting time. Then a truck parked there, only a couple hundred yards away from his stand where he had seen some does the first day. Change in plans! After finding the trucks and logging road John Sr. sat in his stand until after daylight then pulled his map to relocate. Deciding on a spot he had passed through the night before as he was leaving the area. Luck would befall this hunter this morning. After taking down his stand and crossing an open field near the spot he wanted to set up, out comes a doe and a yearling. Dropping low to the ground and watching them they moved down a fence row to his right, then out into a field with soy beans. With the wind in his favor John Sr. eased closer to the fence row to get a better look. Finding the yearling in the field he noted the deer kept looking back at a small group of trees. With his sight blocked by some brush John Sr. moved up closer to find an open spot to see. Just when he found it, out stepped a buck with long tines. Finding the deer in his binoculars he saw that the buck was a nice 8 point and decided to harvest him. The buck was standing, looking right at him, not a good shot, so John waited. Then the buck put his head down and started walking to him, closing the distance and angling off to his left. The buck closed 15 yards and stopped, and began eating on some winter grass. John closed the distance another 10 yards before the buck raised his head and turned slightly giving John Sr. a shot. A shot from the 30-06 made the buck kick high and drop into some brush along the fence row. Running to where the buck had been he found the buck still up wobbling away. A second shot finished him. My sons came to see what dad had got and found him smiling ear to ear. Now it was their turn. The rest of the day was lost to getting the buck out. James had seen some does in the early morning and John Jr. saw does and small buck, but nothing to harvest. The third day of the hunt found the brothers hunting. Early, before daylight, James heard a deer slip by his stand in the dark. The way the does had done the morning before. Not being able to see the deer, he was not sure if it had been a buck or not. Come daylight James and John Jr. were in the stands waiting and watching. James was set up along the edge of a large soybean field in a fence row. Some deer had been moving through the area and there was some good signs. A small pond was near his set up and James soon spotted a deer coming from that area where the deer had gone earlier. He raised his glasses and saw the deer was a buck, and he was coming back toward him. He waited and found the buck in the scope of his 7mm. One shot harvested the buck. James climbed down to check his deer. Walking up to the buck he found he had an odd rack... 3 pts on one side, with 6 pts on the other. But for a young man who hasn't seen many big bucks in our home state, this one was a great prize! 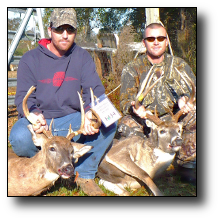 The two brothers got the buck out, with James the one to be smiling ear to ear this time. The rest of the day was spent with James looking to fill his doe tag and John Jr. still holding out for a shooter. Day four was bitter cold that morning, and the day did not improve much. For two brothers it was to sit still. They had swapped stands in hope John Jr. could see a buck. But it was not to be. The men came in without firing a shot. Cold and tired John Jr. was a bit down, and his father was a little disappointed for his son too, hoping he could have gotten a deer. Well, the last morning found us packing out gear and getting everything from our motel for the trip home. But not to be out done John Jr. and James went out for the last morning of our hunt. Come dawn the brothers were in there stands and dad sleeping in the truck, getting ready for the long drive back home. With the temperature up, the morning was not bad. As he sat there John Jr. thought to himself if he saw a doe he would go ahead and fill his tag so they could be on their way home. Little did he know that just across the field his brother James had spotted a deer. With a look through his glasses he saw a huge buck walking through the soybean field. As he watched the big buck he saw his path would take him close to his brother. Within moments a shot rang out. John Jr. had seen the buck, the biggest he had ever seen, and put a shot into him from his 7MM, but the buck had run off with a doe jumping up, joining him. Had he missed? His heart sank, but as he left the stand, he went over the shot in his head. No way did he miss, it was a hit... John was sure. As he went after the deer he came to a large sticker patch and circled around, he came to a small opening that went into a field. He looked up and there stood the buck broad side to him! Stopping, he raised his rifle and fired. The huge buck dropped - right there - a tall 10 pointer! When James came to the truck and told of the buck, he picked up a nickname "El-Moose' Grande" and that John Jr. had gotten a shot. It was a feeling of great joy for John Sr. that both his sons had harvested a deer. When we got to John Jr. we were amazed at the size of the buck. He had a big tall rack, big body, and quite a job to get back to the truck. John Jr. was very happy. This was his first buck, and it had been many years since he had hunted with his father and brother. We loaded the deer and began the long drive home, calling family and friends along the way, telling every one of our great hunt and the fine bucks we were blessed to have harvested. At this time my sons and I would like to thank everybody at Hunting Sports Plus who have made three years with the club very enjoyable. 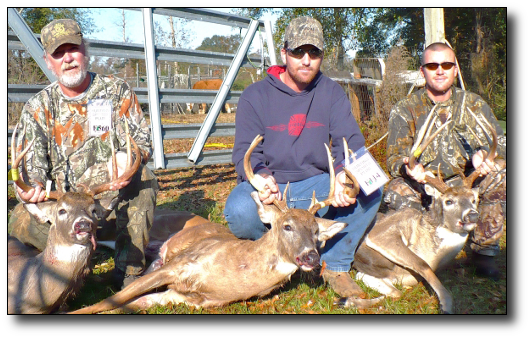 They have always worked hard to provide good places to hunt and answer any questions. I hope everyone has the chance to enjoy the club as much as I have. I'd also like to thank my wife Sharon for the "here we go again" when Nov. comes around. Thanks also to my friend Bennie Schilling for talking me into joining HSP and also for the mounting of the deer. GREAT JOB EVERYBODY! "Thank You" for making this a special year!